In a massive display of social opposition, more than 50,000 teachers, school personnel, parents and students marched in downtown Los Angeles Monday on the first day of the strike by educators in the nation’s second largest school district. The walkout by more than 33,000 educators, the first in the city since 1989, is part of the growing wave of working class struggles in the U.S. and internationally against austerity and social inequality. In comments to the press Monday, LAUSD Superintendent Austin Beutner made the absurd claim that only 3,500 teachers had marched downtown and that substitutes brought in as strikebreakers had carried out a “normal school day.” Reports by the Los Angeles Times, however, cited near empty school auditoriums where a handful of students sat throughout the school day. The struggle in Los Angeles is a battle against the powerful financial and political interests that are pushing for the privatization of public education across the U.S. Beutner, a former investment banker, was appointed by school board officials whose elections were funded by the Eli Broad Foundation and other billionaire school privatizers. 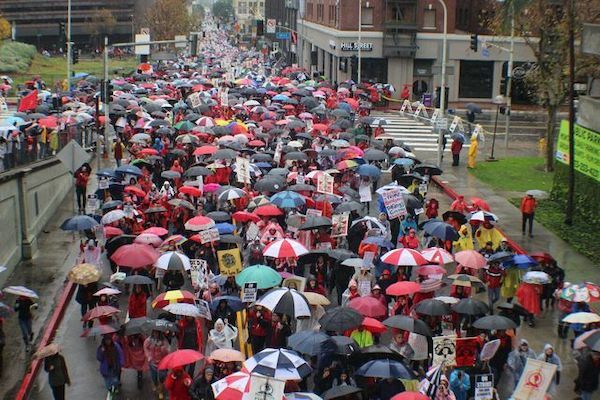 The strike has won overwhelming popular support, with messages of solidarity flowing in from teachers across California, the U.S. and internationally. Like their counterparts in LA, school officials in Oakland claim they are facing insolvency due to health care and pension obligations and are pushing for the closure of one-third of the district’s schools while expanding charters. Three thousand teachers, parents and students marched Saturday to oppose privatization and demand improved wages and school funding. Far from mobilizing this powerful support, the United Teachers Los Angeles (UTLA) and its parent organizations, the National Education Association (NEA) and the American Federation of Teachers (AFT), are blocking any broader mobilization of educators and other workers across the state. They are encouraging illusions that the Democratic Party establishment, which controls the city and state government, will circumvent Beutner and address teachers’ demands. In a statement on the strike Monday, newly inaugurated Democratic Governor Gavin Newsom, who was backed by the UTLA and other unions, made it clear he had no sympathy for the teachers’ demands and echoed Beutner’s self-serving statements that the teachers were hurting students by striking. The UTLA is urging teachers to put their faith in the $700 million Newsom says he will provide school districts over the next two years to pay down their obligations to the California State Teachers’ Retirement System, which could free up $140 million for the LAUSD to spend on teachers and classrooms. Even if this pittance were spent on the schools, and there is no reason to believe it would, it would not solve the immense problems confronting LA teachers. Teachers have not seen a real raise in a decade, despite impossibly high housing and other expenses. They face chronic shortages of staff and supplies and the relentless campaign to drain resources to fund charter schools. Nor would this address the catastrophic social problems confronting the district’s 650,000 students, 80 percent of whom are low-income and poor. Well aware that teachers are determined to fight school privatization and worsening social inequality, UTLA President Alex Caputo-Pearl, in a morning press conference, railed against “billionaire privatizers” and called for a mass protest in front of the California Charter School Association on Tuesday. He said the attack on public education came from every level of government. At no point, however, did Caputo-Pearl point out that it was the Obama administration and successive Democratic state governments in California that are responsible for these attacks. Moreover, the UTLA has already dropped teachers’ demands to oppose the expansion of charter schools, ceaseless standardized testing and other “school reform” schemes, accepting the bogus argument that these issues cannot be bargained under state law. Caputo-Pearl reiterated that increased state funding and school privatization could not be resolved through the strike but only by appealing to the Democrats to pass “common sense” legislation to cap charter school expansion. Also at the morning press conference were NEA President Lily Eskelsen García and AFT President Randi Weingarten, who shouted out patronizing and empty slogans about how “proud” they were of LA teachers for standing up. Both union officials promised to “support” LA teachers in the same way they had striking teachers in West Virginia, Oklahoma and Arizona last year. This should be taken as a warning. The NEA and the AFT, which are allied with the Democratic Party, did everything to sabotage those statewide walkouts before they could coalesce into a national strike against the austerity policies of both corporate-controlled parties. Weingarten (annual salary $514,000) and García (annual salary $317,826) did not pledge any money to provide strike benefits to teachers. Although the AFT and the NEA collectively control billions of dollars in assets, plus pension investments worth trillions, their local affiliate, the UTLA, has told teachers to bite the bullet and, if necessary, to apply for loans backstopped by the union’s strike fund. To spread the strike throughout the state, teachers must take the conduct of the struggle out of the hands of the unions by forming rank-and-file strike committees to reach out to educators across California, nationally and internationally. Rank-and-file committees should outline their own demands, including a 30 percent wage increase and the reconversion of all charter schools into public schools, and oversee all negotiations. Teachers should appeal to support staff and charter school teachers to defy the unions and join the strike. They should also reach out to other sections of workers—locked-out federal workers, Amazon, UPS and other logistics workers, oil refinery workers, dock workers, telecom, tech and manufacturing workers—to build up support for a general strike to fight austerity and social inequality.